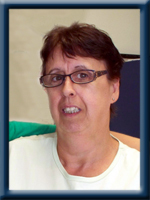 Balcom, Mary Gladys “Midge”, 65, of Milton, Queens County, passed away on Saturday, April 19th, 2014, at home, surrounded by her loving family. Born in Milton, she was a daughter of the late Herbert and Olive (Wamboldt) Whynot. Midge worked for many years in small options homes as a care taker and in her later years she worked as a housekeeper. She enjoyed going for drives, reading, and cross word puzzles, but was the happiest when she was spending time with her grandchildren. She is survived by her loving companion, Sydney Whynot; a daughter, Bonnie Balcom (Charles Doubleday), of Milton; grandchildren, Makenzie, Keelie; chosen granddaughter Tenesha Foster; sister, Doris, of Milton; brothers, Elwood (Paula), Jordan (Catherine), Irving (Jeanette), Cecil (Lucille), all of Milton, Roger (Patty), of Gull Island. She was predeceased by he husband Robert Balcom Jr.; sisters Mary, Betty, Catherine; brothers, Ronald, and Herbert Jr..
Cremation has taken place under the direction of Chandlers’ Funeral Home, Liverpool. A Celebration of Midge’s Life will be held on Thursday, April 24th, 2014, at 11:00 a.m., from Trinity Anglican Church, Liverpool. So sorry to hear of Midge’s passing…our thoughts and prayers are with you all during this very sad time. I am so sorry to hear of Midge’s passing. Please know that my thoughts and prayers are with at this time. We are so Sad to hear Of Your Sisters Passing, May God Be With You All at this most Difficult time in your Lives!!!! So sorry to hear about Midge she was nice person and well liked by many. She will be greatly missed by one and all. Thinking of you all at this sad and difficult time. Bonnie, I am so sorry to hear of your mom’s passing. She was liked and loved by all who knew her. My thoughts and prayers are with all of you at this sad and difficult time. Sidney and family: midge was a very nice person to know and talk to she will be missed by all who knew her .peace be with you all at this time of loss. To Midge,s Family. So sorry to hear about Midge, I liked her and she was a nice person. Our thoughts and prayers are with you all. Bonnie, I’m so sorry for your moms passing.. she was a great woman, she sure helped mom out while working with her for years.. be strong and remember the great woman she was and will continue to be. So sorry to hear of Midge’s passing our thoughts and prayers are with you at this time . sorry to hear of your loss. deepest sympathies to you all in your time of sadness. Sorry for your loss. Our thoughts and prayers are with you all. SIDNEY & BONNIE .I AM SO SORRY FOR YOUR LOSS .MIDGE WAS A WONDERFUL PERSON .THINKING OF YOU AT THIS TIME . Sid and Bonnie and families………So sorry to hear of Midgie passing. She was a very caring person and had a heart of gold. Remember the good times you all shared together. Bonnie, Charlie & family, so sorry to hear of your Mothers passing. Our prayers and thoughts are with you at this very sad time. Remember all the good times and she will be always with you. Syd,Bonnie and family.I am so sorry to hear about Midge..My condolences to the family. So Sorry To Hear Of Midges Passing Please Know That You Are In Our Thoughts. I am so very sorry to learn of Midge’s passing. She was a good friend to our mother Janet for many years, and never more so than in the last year of Mom’s life. We knew Midge was struggling with health issues of her own during that time, but her kindness and caring toward Mom never wavered. Please accept my condolences on your loss at this very trying time for all of you. So sorry for your loss, take care of your self. Thinking of you all. Our deepest thoughts are with you all now.Hope you can find strengh in each other at this time of need. Sid,Bonnie and family.I know no words can fill the emptiness you feel right now.They say time heals all wounds.I sure hope so.I was with Liz the last time they talked on the phone.May they both rest from the pain. Bonnie, Syd and family so sorry to hear of Aunt Midge’s passing. May you find comfort in the memories you hold. We will keep you in our thoughts and our prayers. So sorry to hear about Midge. May God bless you all and help you through this difficult time. To all of Midge’s family please except our deepest sympathy on the passing of your mother, grandmother, sister and friend. May you take strength in knowing that she is now in God’s hands and will be well taken care of until you meet again. Our prayers and best to you all at this sad time. To all of Midge’s family I send my deepest condolences for your loss. Treasure the memories for they will help you all through this very difficult time. We are so sorry for your loss. Midge was a wonderful person who always took the time to stop and talk.She will be missed by those who were blessed to have known her. We are so sorry for your loss. Please accept our sincere sympathies to you and your family. Lean on the love and support from others and cherish the memories to help get you through the difficult times ahead. Please Accept our heart felt prayers and thoughts at this difficult time. Midge was a great person. I am so sorry for your loss. Midge was the kindest, most hard-working lady I have ever met. I had the honor of working with Midge for a long time when we worked together at M & B Home care. What fun times we had. How she loved her family. Sid used to drop Midge off at work everyday and pick her up like clock-work. Midge always said how she could always rely on Sid. Her grand-children, Bonnie, Charlie and Nisha (that’s what she always called her) She loved them so much. I remember how much she loved Christmas. She used to start her shopping early so she had everything she wanted for everyone. When you came in to relieve Midge from a shift you always knew you would have nothing left to do because she always had it done. The place was spotless . How she could clean . And the baking and cooking she did for Wayne, Brenda and Marilyn. Midge will always be there for all of you. She is your own special Angel now. She will be remembered fondly by all that knew her. Take Care. Very sorry to hear this, I enjoyed Midge very much. When she worked in the small option home beside my house we had some great conversations. Her and Wayne used to love sitting out on the front steps talking to the passing people and myself.She was a great person….